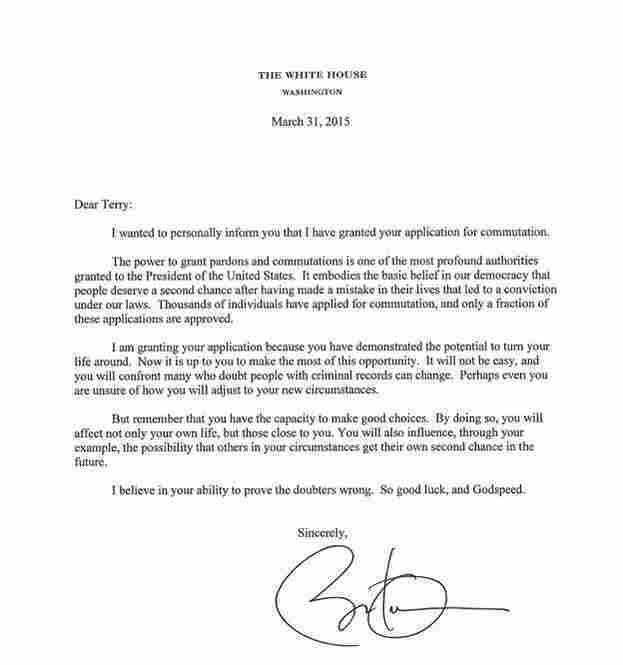 READ: Commutation Letter President Obama Sent To Inmate : The Two-Way President Obama commuted 22 sentences for federal prisoners serving time for drug-related crimes. He said that under current laws, those inmates would have already been released. President Obama commuted the sentence of 22 federal prisoners who were serving time for drug-related crimes. Obama has done this in the past, saying that under current laws those inmates would have already been released. Today, however, his senior advisor, Valerie Jarrett, tweeted a picture of the letter Obama sent Terry Andre Barnes, who was sentenced to more than 20 years in prison in 2005, for "conspiracy to distribute cocaine base." Barnes is now expected to be released July 28. "The White House said Obama made the move in order to grant to older prisoners the same leniency that would be given to people convicted of the same crimes today. "In issuing the commutations Tuesday, Obama has more than doubled the number he's granted in his presidency. Before Tuesday, he had issued just 21 and denied 782 commutations in his more than six years. It was the most commutations issued by a president in a single day since President Clinton issued 150 pardons and 40 commutations on his last day in office."